Proper diet is an important part of your pet's health and can also manage the symptoms and progression of specific diseases. Should your pet need a new diet due to health concerns or you are just looking for a healthy alternative to your pet's current diet, we offer individual consultations and nutritional plans to help keep your pet healthy. Any sudden change in your cat or dog’s eating habits or a sudden increase or decrease in weight could be symptomatic of many underlying diseases. A good balance of carbohydrates, proteins, and fats is essential for maintaining your pet’s overall health. Our veterinarians can recommend a diet that best fits each pet's nutritional needs including age, weight, activity level, allergies, etc. Prescription pet foods can help with allergies, puppy and kitten health, weight management, aging health, oral health, and problems with the digestive system, thyroid, bladder, skin, joints, and more. Pet obesity is also a growing problem that contributes to a host of pet health conditions including osteoarthritis, diabetes, high blood pressure, breathing problems, kidney and heart disease, and a life expectancy shortened by up to 20%. Hill's Pet Nutrition offers the following body condition score card to help you determine if there is just a little too much of your pet to love. 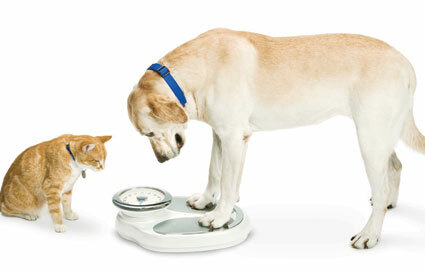 Be sure to discuss your concerns with your veterinarian before making any drastic changes to your pet’s diet.